It’s Christmas Day and all over the world people are celebrating. And feasting. Here, it’s summer time, but because so many of us have ancestry from the northern hemisphere, we all still dream of a white Christmas (though many of us have never experienced snow) and the shop windows are full of fake snow — even while we’re roasting in the heat. A lot of people still eat the full traditional Christmas dinner, with roast (baked) meats and vegetables, followed by the traditional plum pudding. 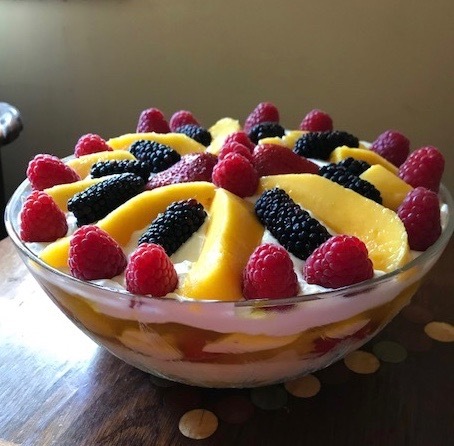 Put a layer of cake in the bottom of the bowl, sprinkle it with sherry (or orange juice), then layer in fruit, custard, fruit, jelly (jello) and repeat the process. 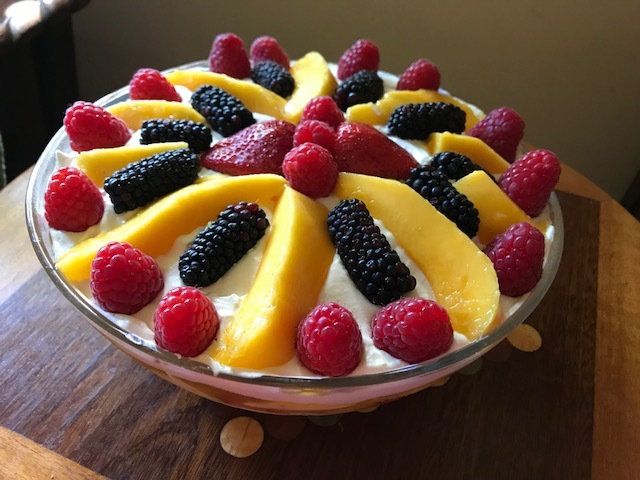 I always use fresh fruit – for this one I used mostly mangoes and lots of blueberries, strawberries, youngberries and raspberries, but I’ve also used other fruits in the past — bananas, passionfruit, peaches, apricots, kiwifruit — anything yummy, really. Mostly I try to use fresh fruit, but if fresh fruit is in short supply, a little added good canned fruit, like sliced peaches, is fine. The final layer is freshly whipped cream topped with fruit. It’s light and yummy, and even nicer the second day. (In fact I did all except the final whipped cream and fruit layer the night before.) And perfect for dessert in the warm weather. Do you like trifle? Do you usually have plum pudding for Christmas dinner or not? Wishing you all the best for the festive season. I’m very fond of making edible gifts — really it’s just an excuse to make something fun, and then give it away so that I’m not tempted to eat it myself. 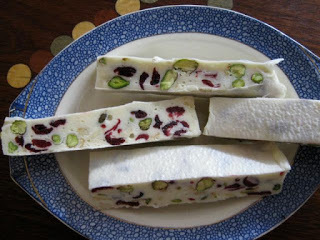 This year I made “Christmas crack” and white chocolate nougat. Both are quite easy to make but look pretty and, wrapped in cellophane, make lovely small edible gifts. The nougat is on the right. I use a “cheat’s recipe” passed on by a friend. Her recipe only used almonds, but I switched it to almonds, pistachios and dried cranberries to make it more Christmassy. When I put it on my Facebook page, so many people asked me for the recipe, I thought maybe it ought to go here, as well. So here’s the recipe. The other thing I made—and I often make this for Christmas, as it’s so yummy and people always love it — is called “Christmas crack”. 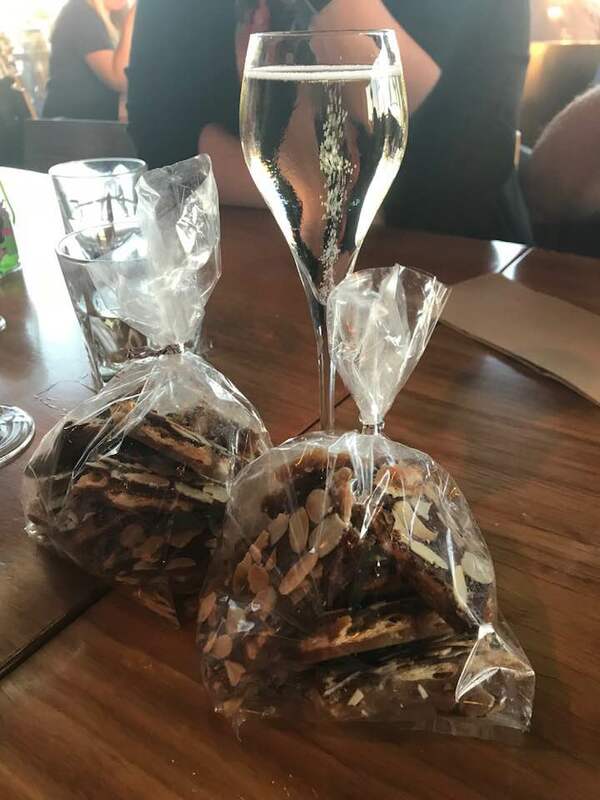 It’s a layer of salted crackers with toffee baked over (and into) them, then chocolate melted over that and sprinkled with toasted nuts – I use flaked or slivered almonds. It’s made as a slice, and you chill it in the fridge and then break it up. It’s toffee nutty salty chocolatey goodness — and be warned, it’s addictive. Here are two of the little bags of Christmas Crack that I gave to friends at a pre-Christmas author dinner. There are heaps of recipes on the web, and here’s one. All the very best for the festive season. I hope you have a peaceful and happy time, with good food and good company. When I was a kid I loved bread and butter cucumbers, but these days the bought ones taste just a bit too sweet for me. But lately I’ve had a yen for some, and the other day I cracked! I looked up a recipe on line and decided to make some myself. 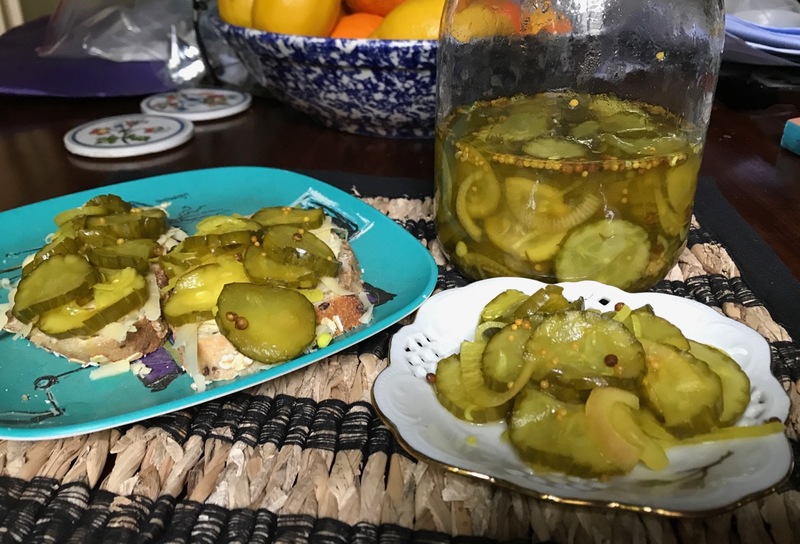 Everything was already in my pantry, and I had three Lebanese cucumbers in the fridge just waiting to get pickled! It was amazingly quick and easy — just slice and salt the cucumbers and onions (I only had shallots), and let then sit overnight in the fridge. Next day spice up some apple cider vinegar, then add the cucumbers. The whole thing took about 15 minutes — including the slicing. I used half the amount of sugar and they’re still a bit sweet for me, but very tasty. I ate the results for lunch — still warm with grated tasty cheese on wholegrain bread. Delish! I’ll be making this again.